What is Nowruz you ask?….. It’s a 3000-year old Persian celebration of spring, rebirth of nature, and hopes for a wonderful new year ahead. It literally means “a new day”. It’s celebrated in many countries in Asia and middle east , such as Iran, Tajikestan, Azerbaijan, and Uzbekistan. – Poetry book of Haafez or a religious book such as Qoran. Another interesting point is that the arrival of the new year is celebrated at the exact astronomical moment of the change of the season from winter to spring. This means that the new year is not celebrated at 12:00 midnight, but at the exact second of the start of the new year! This exact second is called “Saal Tahvil” in Persian. Usually families gather around the “Haft-seen” table and just before the “Saal Tahvil”, they read a few poems of Haafez or a few verses from a religious book, such as Qoran, to bless the new year. After the “Saal Tahvil”, they hug and kiss, and exchange gifts, known as “Eidi”, and the celebration of spring starts with eating the many delicious dishes of the Persian cuisine!! Parents and especially, grandparents, usually give their kids and grandkids a sum of money as “Eidi”. Because of this, as a kid growing up with this wonderful tradition, I was always waiting to collect my precious Eidi’s as soon as “Saal-Tahvil” happened and planning what I’m gonna buy with them sometimes weeks in advance! In Nowruz, the most traditional food is “Sabzi Polo Mahi” or “Saffron Herb Rice with Fish”, but each family can cook a different dish depending on what they like. This year I decided to cook one of my favourite rice dishes called “Reshteh Polo” or “Saffron Rice with Noodles, Sultanas and Walnuts”. 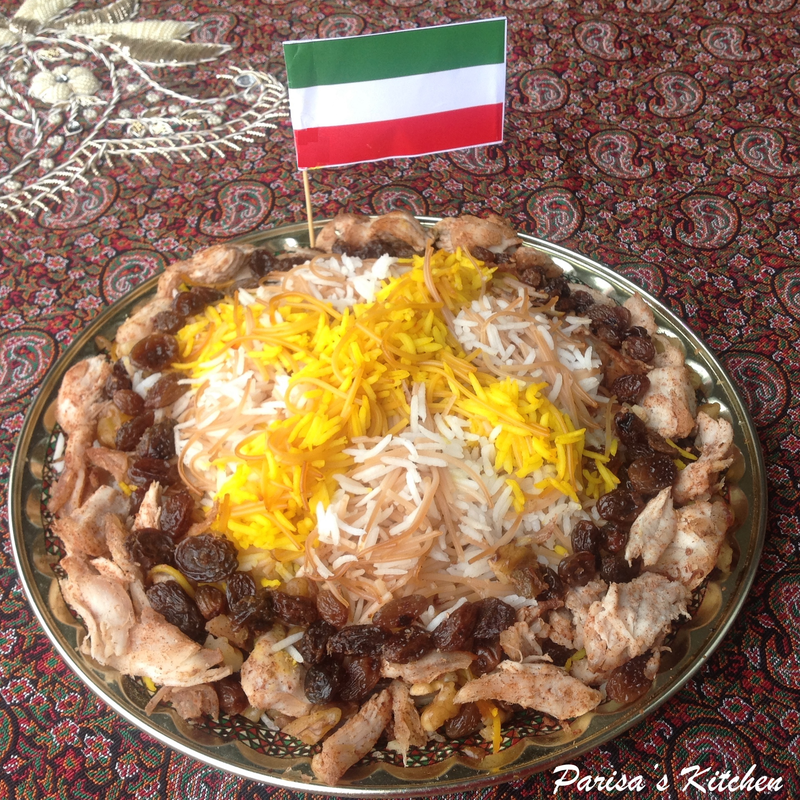 The special ingredient in this dish is the “Reshteh” or Persian noodles for adding to rice. There are other Persian noodles, which are white and thicker. They are usually added to soups only. You can find “Reshteh” for rice in your local Persian grocery store. Don’t be intimated by the look or the difficult name of this dish, it’s really super easy to make! So without further a due, I present to you my “Reshteh Polo”!! 1- Rinse the rice with cold water a few times until the water passed is clear. 2- Place the rice in a pot, and pour cold water on it to cover it completely. Add the salt and stir. 3- Bring the pot to boil, let simmer for ~10 minutes, until rice is cooked. You want it to be cooked and a bit ardent. Then, drain and set aside. 4- Place the noodles in another pot of boiling water and let simmer for 3-5 minutes until al-dente. 5- Drain the noodles, then mix through the rice. 6- Separate three table spoons of rice, add the saffron to it, and set aside. 7- In a frying pan, add the walnuts, sultanas, chicken/meat pieces, cinnamon and a bit of olive oil. 8- Keep string this mixture on medium heat for a few minutes until you can smell the aroma of the walnuts and cinnamon. 9- Now you have all the necessary elements of “Reshteh Polo”, just assemble as you like! Easiest way is to mix all of them together: saffron rice, noodle rice, and walnut-sultana mixture. Or, you can put the rice first in a dish and then decorate it with other elements as you wish. 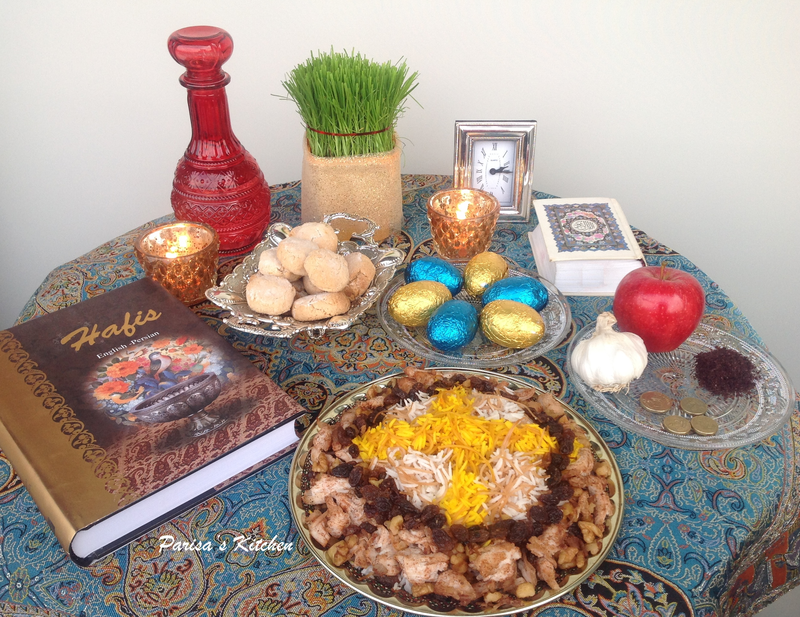 Posted in Nowruz, Persian, RiceTagged healthy, noodle, noruz, nowruz, persian, polo, reshteh, rice, saffron, sultana, walnutBookmark the permalink. Darling Happy Nowruz. Your presentation for Nowruz is unique, full of beautiful colours announcing spring time in our dear country. Your passion and creativity have completed your colourful haft-seen design presenting your love of our deep and meaningful culture. Absolutely delightful post with stories, colorful photos, music, dance and reshteh polo! I love reshteh polo and this one is special with the addition of walnuts. I really enjoyed the post. Happy Nowruz to you and yours! I’ve never had this before, but it looks absolutely mouthwatering. I love the idea of incorporating reshteh into polow. Well done! Thanks a lot Sina! Hope you like it when you give it a go! Love this presentation about Nowruz and the rice. I will have to make it, hopefully tonight! Happy New Year Parisa joon! What a lovely post. I’ve never made reshteh polo but your recipe has inspired me to give it a try. Thanks so much for sharing!